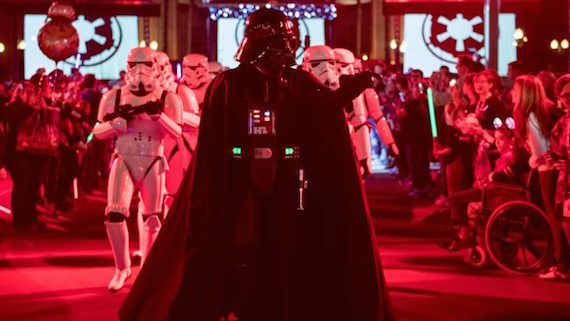 Tickets are now on sale for Star Wars: Galactic Nights, the one-night special event will return to Disney’s Hollywood Studios® at Walt Disney World® Resort on May 27, 2018. Star Wars: Galactic Nights is a thrilling Star Wars-themed event held after park hours from 7 p.m.-midnight. It celebrates the entire Star Wars saga with out-of-this-world entertainment, special photo opportunities, event-exclusive merchandise and food and beverages, and encounters with rarely seen characters that guests can only experience during Star Wars: Galactic Nights. Star Wars: Galactic Destinations Projections Transform The Hollywood Tower Hotel– Visible on the Sunset Boulevard area of the park the facade of the Hollywood Tower Hotel will transform via stunning projection technology to showcase familiar locations from across the galaxy. Favorite film moments, special effects, lighting, and of course the stellar Star Wars cinematic score supports each galactic location moment all night long. Star Wars Galactic Destinations is currently an event exclusive. Special Photo Ops – Throughout the park, guests can step into immersive and iconic scenes from their favorite Star Wars films in a series of incredibly detailed photo locations. These special photo ops will only be available at Disney’s Hollywood Studios during Star Wars: Galactic Nights. Tickets are on sale now. In addition, intergalactic foodies attending Star Wars: Galactic Nights can now purchase the Galactic Tasting and Viewing Package, featuring Star Wars-inspired food and beverage and reserved seating to a panel providing an inside look of the making of Star Wars: Galaxy’s Edge. The Galactic Tasting and Viewing Package is now available for $30 per person, including tax. If you’re interested in purchasing tickets for this event, click here to contact me as soon as possible, as this is expected to sell out.